A man overboard rescue can be accomplished with a very simple manoeuvre. This is especially useful for a short-handed crew - i.e a couple cruising. Although there are a number of different manoeuvres a helmsman can choose from – all with their pros and cons, this simple manoeuvre is designed to get a towable flotation device to a person in the water as quickly and as safely possible. The towable flotation device can be a Lifesling© or a life ring permanently secured to the boat with 125-150 feet/40-50m of floating line. This manoeuvre is known generally as a 'quick stop' and the illustration below shows how it is done. 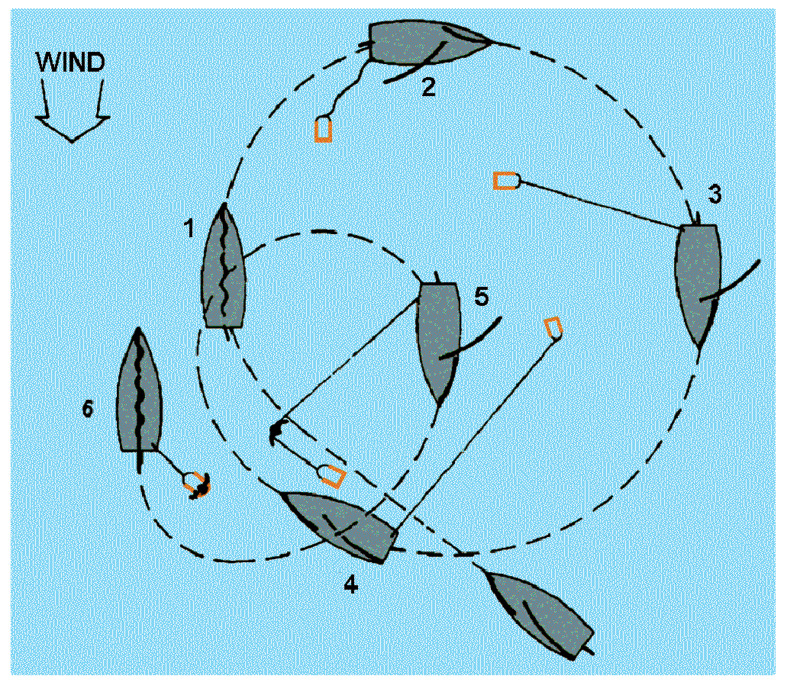 Luff into the wind immediately, then make one or more loops around the victim. To slow the boat and avoid distraction by sheets, trim the sails flat (with the jib left trimmed to one side), or furl the jib. Continue to circle the MOB in loops of decreasing diameter until the line attached to the flotation device is dragged across to the MOB. Do not try to get the flotation device exactly to the MOB. As long as the line gets to them, they can get the device. Once they have the flotation device, carefully draw them alongside. Do not tow them through the water – this is a recipe for drowning the MOB. The final step is to get the person out of the water and into the safety of the boat. This is a crucial step in the rescue process. MOB testing and research has shown how difficult it is to help a person in the water clamber back on board. The freeboard can be an insurmountable barrier. If the person is incapacitated, hypothermic or exhausted, it may be nearly impossible to do so without equipment. Considering that the rescuer may be the lighter, less-stronger crew member, you have all of the ingredients of a tragedy. 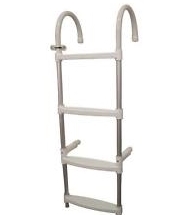 A very good way to get a victim back aboard is with a strong, well-built ladder. 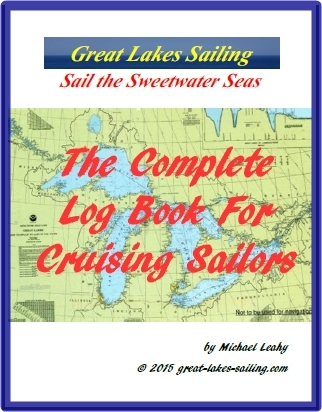 Some jurisdictions around the Great Lakes require a vessel to carry a 're-boarding device' – i.e. a ladder that can be hooked on to the gunwales to assist a MOB regaining the vessel. Even if not required, every boat should have one. Many boats have swim platforms or ladders that can be used to help a MOB get back on board. However, be aware that in rough water conditions, the swim platform may cause serious injury to a person in the water beside it. A line can be secured to a cleat near the bow and led back to a winch and allowed to droop into the water. It can serve as a much-needed step for a MOB and a person aft can assist them with the winch. 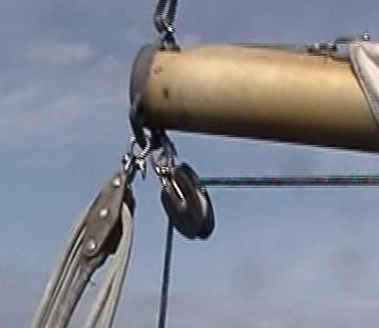 With a Lifesling©, you will need a block & tackle (6:1) which can be secured to the end of the main boom. Sometimes, making a Mayday call, keeping the MOB secured next to the boat, and waiting for help to arrive may be the only course of action remaining. But remember, the MOB will continue to experience a dropping core body temperature leading to hypothermia and possibly death while waiting for help to arrive. A final note about retrieving a MOB is to continue talking to the person. There have been situations where people who struggle mightily to survive going overboard, seem to give up that struggle when rescue is imminent. Once the MOB is onboard, treat for possible hypothermia. A much more detailed discussion of how to treat hypothermia is here. 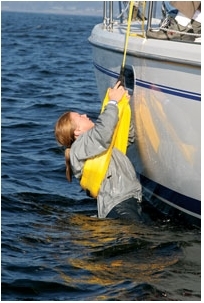 Man overboard rescue and recovery techniques are frequently not practised by cruising couples or crew. Don't wait for an emergency to happen to figure out what to do. Try to find or make opportunities to practise the manoeuvres you would use to rescue a person who has fallen overboard.